For years, I have listened to Disney Parks music. On streaming Internet radio, on CDs from various Disney parks and just while I am in the parks, I can’t get enough of the sounds of the parks. One song I have listened to always makes me smile, which is the song with the lyric “I’m walking right down the middle of Main Street, USA.” I don’t know the title (I could probably find it, but it doesn’t really matter to me), but the song always brings light feeling to my heart. In the end, though, I have wondered how the song relates to Disney. 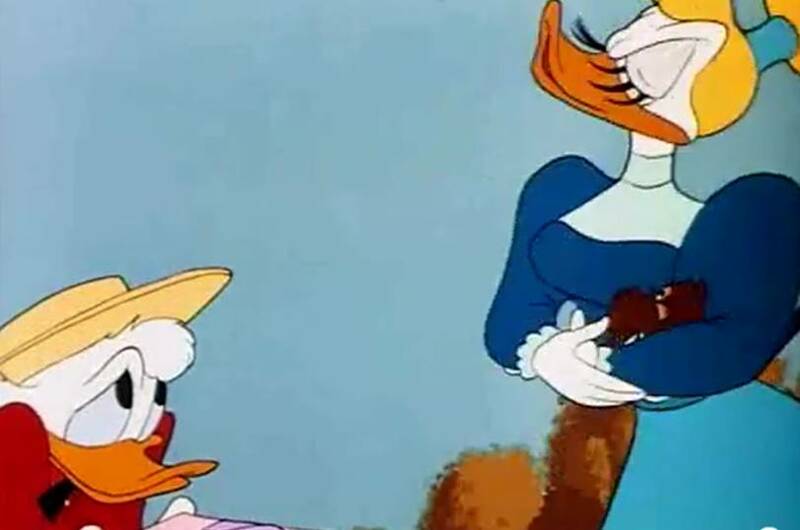 In Crazy Over Daisy, the latest Donald Duck short from 1950, I got my answer. 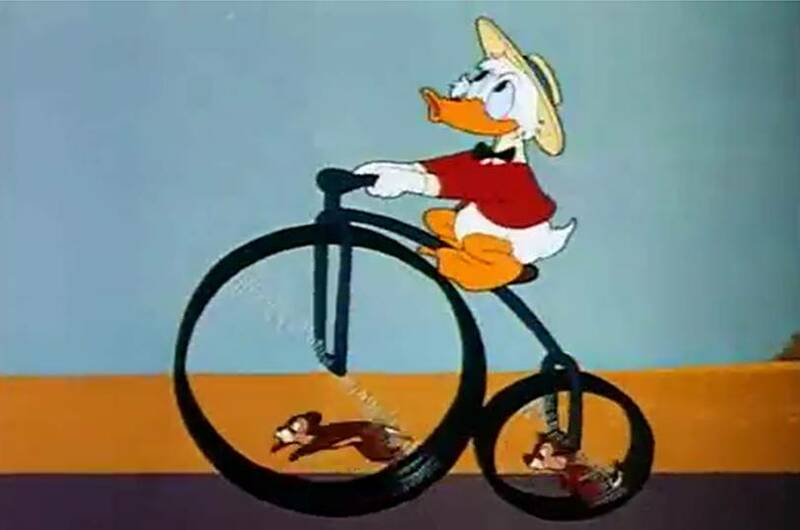 Set in the same turn of the century setting as Main Street USA, we get Donald Duck on an old time bicycle riding through the middle of town on his way to court Daisy Duck. And while doing so, the background music is that very song. That immediately vaulted this short to one of my favorites. There are so many elements here that work beautifully beyond the music, though. 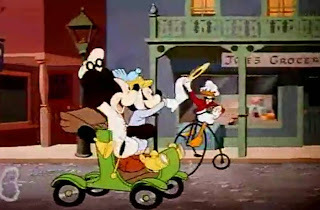 We have the concept of a shared universe at work, as we see Donald cycling through town waving at Mickey and Minnie who are driving around, at Goofy who is making deliveries, and finally running into his nemeses – Chip and Dale. Having all the characters together in one fell swoop is fantastic. It really builds the world of this short quickly and had me drawn in right away. The main failing of this short is Donald’s rivalry with Chip and Dale just frankly makes no sense. In the other shorts where these three have battled, there was a clear reason for it. The chipmunks were trying to steal food for the most part, but there was always a good reason why they fought Donald. Here it seems like they are just picking on him, trying to derail him from visiting Daisy. It makes them come off in a bad light, at least to me. The ending of the short, though, makes up for it in sheer comic brilliance. With Donald harnessing the chipmunks to power his bicycle, he thinks he has solved the problem and makes his way to Daisy. 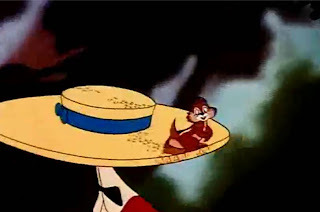 But when his lady fair sees what he’s done to those “adorable” chipmunks, she is shocked and appalled, and leaves him in the dirt in front of her house to comfort the chipmunks. It makes for a fun, breezy short that left me wanting to immediately head to Disneyland and walk down Main Street.